On the Joliet station’s northeast corner, gracious archways transition between a covered entryway and a welcoming pedestrian plaza. 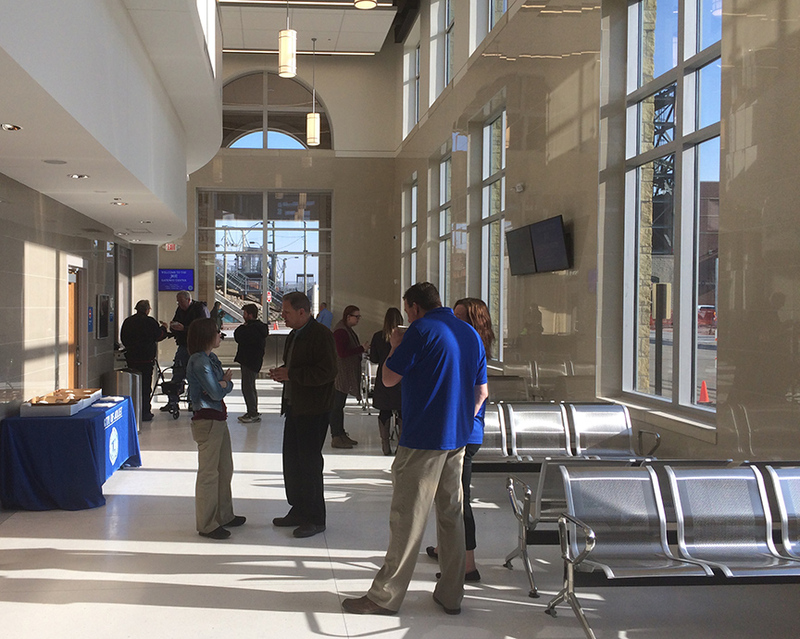 JOLIET, ILL. – On April 11, 2018, Amtrak moved into a new train station designed as part of the Joliet Gateway Center. Customers were welcomed with complimentary coffee and donuts during the morning rush. The larger Gateway Center complex includes the historic Joliet Union Station – now used for events and retail; the new train station – occupied by Amtrak and Metra; a planned bus station; and new rail platforms, pedestrian tunnels, elevators and parking. The project also included track realignment. The city of Joliet unveiled plans for the Gateway Center in March 2010, with a vision of uniting the services of Amtrak, Metra, PACE local buses, intercity passenger buses, Chicago airport shuttles and taxis in one easily accessible downtown location. Within a short walk of Gateway Center are the Joliet Slammers’ baseball stadium, Rialto Square Theatre and the Will County Courthouse. A groundbreaking for the city-led Gateway Center project was held in 2012 following design work. The station includes a full height lobby flooded with natural light; there are waiting and ticketing areas for both Amtrak and Metra customers. Rail customers now enjoy a two-story, 10,300 square foot structure with waiting areas and ticket desks for Amtrak and Metra. Designed by the team of RATIO | Knight, the station is built of precast concrete and pays homage to historic Union Station in its form and materials. Walls are clad in rock-faced ashlar limestone, and two-story archways open onto a welcoming pedestrian plaza. Airy interiors are filled with natural light from large windows. The new Joliet station is also a component of the Illinois High-Speed Rail Program designed to improve the vital Chicago-St. Louis rail corridor and allow faster travel times. Amtrak provides ticketing and baggage services at the Joliet facility, which is served by eight daily trains. The Lincoln Service is financed primarily through funds made available by the Illinois Department of Transportation. In fiscal year 2017, more than 61,000 Amtrak customers began or ended their journeys in Joliet.